Cruises from Port Canaveral go to several destinations. The most frequent are the nearby Bahamas and Eastern Caribbean. Other options are the Western Caribbean and Bermuda. The Bahamas are close to Florida and a short voyage from Port Canaveral. 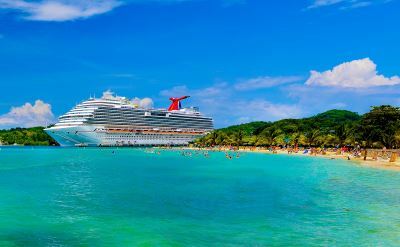 Most of the cruises are just 3 or 4 days long, and can easily be combined with a trip to the theme parks in Orlando for a fun week of vacation. In Nassau or Freeport you can golf, learn windsurfing, gamble or shop. Clear waters and soft sand make it a place to spend a day at the beach or take a snorkeling or diving excursion. Private islands owned by the cruise lines are a big attraction of Bahamas cruises. 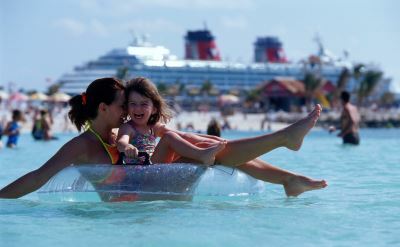 You and your family will have a great time at Castaway Cay, Half Moon Cay, or CocoCay. Castaway Cay is Disney Cruise Line's private island in the Bahamas. It's full of fun for the whole family. 3 Day Cruises from Port Canaveral mainly go to the Bahamas. These quick voyages are perfect to combine with a trip to a theme park in Orlando. 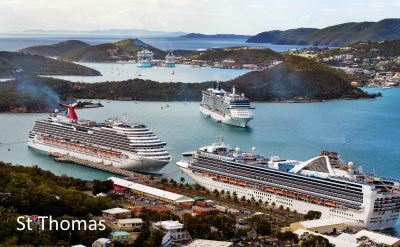 Eastern Caribbean cruises go to sunny islands. St Thomas in the US Virgin Islands is one of the usual stops. Explore the shops, go snorkeling, ride the Skyride, tour historic sites, or visit gardens. On the island of St Maarten there's a beach by an airport runway and planes come in right over your head. You can also ride a jet-ski or explore the boardwalk and beaches. Southern Caribbean go deep into the islands. Visit exotic, less-visited places like Aruba, Bonaire and Curacao. Western Caribbean cruises sail to exotic destinations like Cozumel, Jamaica, Roatan, and Belize. From the island of Cozumel you can take an excursion to an ancient Mayan city. Belize has amazing natural areas. Roatan offers excellent snorkeling. Bermuda cruises go to islands in the Atlantic. Bermuda is famous for pink sand beaches, short pants, spicy food, historic sites, colorful buildings, and a barrier reef. Transatlantic cruises cross the ocean to Europe. One-way voyages to Spain or England. There are also cruises to Orlando from Baltimore and New York. They are an alternative to departures from Port Canaveral.